A group of friends get together once a month to try different beers. I happen to be the host of this month’s meeting and the theme will be “A Visit to an English Pub”. 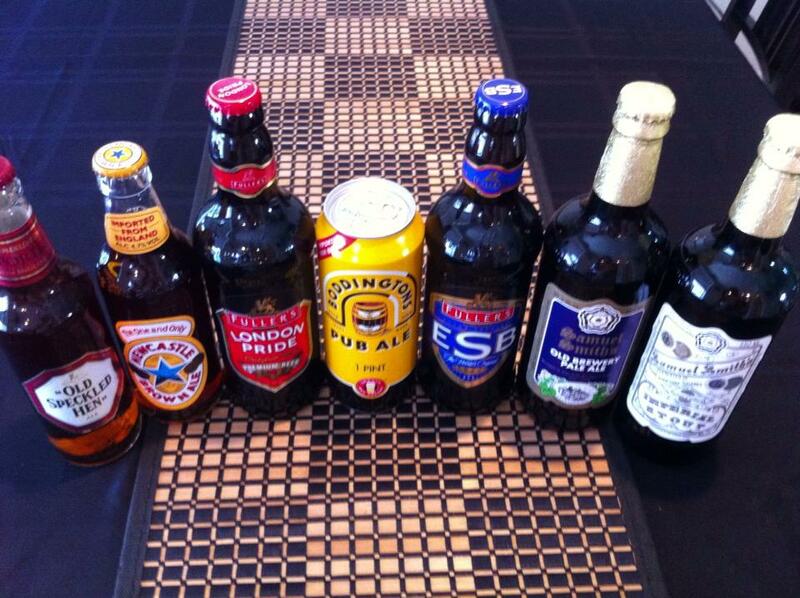 England brews beer since pre-historic times, mostly top-fermenting Ales. Originally, a brew was an “Ale”. Add hops to ales and you get “Beer”. In England, beer (or “bitter”) is a normally a Pale Ale. Mild, Brown, Old, and India are variations of Pale Ales styles (but the Brits are very bad at agreeing exactly on what defines each style). Beer in England is served at cellar temperature (about 55F) and is meant to be cask-conditioned in a Pub’s cellar and be poured from a tap. But in the era of InBev and Bev&More, we get it pasteurized and shipped to our door (and we will drink it a bit colder). When tasting English beers, you say “flavour”, “colour”, not “flavor” and “color”. We start with two brown Ales that (based on my limited experience) are not commonly found in London English Pubs. New Castle Brown Ale (4.7% ABV) – Probably the most common in Californian supermarkets in this set, most people has had it before. It originates in the North-east of England (but today owned by Heineken), it is known in England as a working man beer. You have drunk it, but have you tasted it? Old Specked Hen (5.2% ABV) – I found it first here in California and felt in love. But loves wear off eventually. I always get a bit disappointed because it looks so beautifully red against the light in its clear bottle, but it turns amber-brown when we pour it in the glass.‘Old Speckled Hen’ has a full, smooth flavour and is very easy to drink. Fruity aromas are complemented by a blend of malty tastes and a dry finish. Fuller’s London Pride (4.7% ABV) – I found that if you walk into a London Pub, walk by the old guy sitting at the end of the bar and order “a bitter”, 7 out of 10 times, that is what you get. Boddington’s Ale (4.6 %ABV) – Originated in England’s Northwest (now owned by InBev). If you like creamy beer (I do), Boddington’s is usually served in the pub extra “nitrogenated” (mixed with N2 gas at the tap, like Guinness). Having it from the can won’t feel the same, but it had to be part of the standard set. Fuller’s ESB (5.9% ABV) – ESB stands for “Extra Special Bitter”. It is slightly stronger and supposedly more premium cousin to the London Pride. Samuel Smith Old Brewery Pale Ale – It originated in Tadcaster, England and it is the last of the most traditional mainstream breweries to remain independent. Their beer (including the two in today’s tasting) are fermented in in “stone Yorkshire squares’~ fermenting vessels made of solid slabs of slate ~ which give the beers a fuller bodied taste, using the same strain of yeast since the nineteenth century. Samuel Smith Imperial Stout (7%ABV) – This distinctive type of beer, like the IPA, was originally brewed to withstand the abuses of shipping in foul weather to Imperial Russia. It was a favourite of Russian nobility whose taste for the finest food and drink was world famous. A rich flavourful brew; deep chocolate in colour with a roasted barley nose and flavour that is a complexity of malt, hops, alcohol and yeast. Fermented in ‘stone Yorkshire squares’.